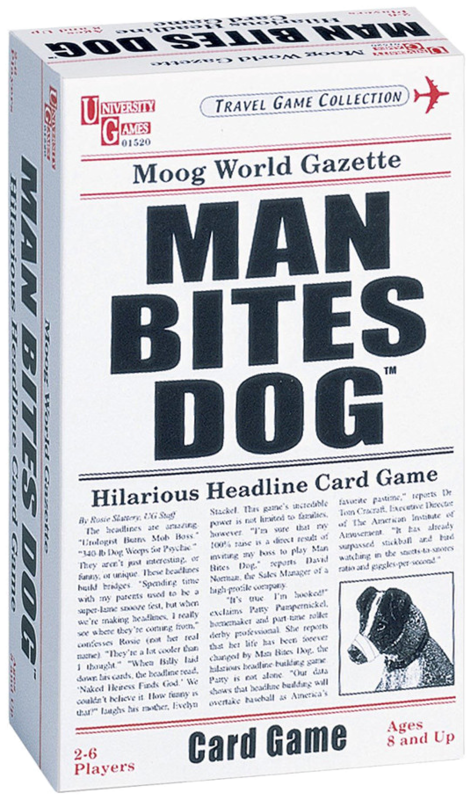 Unlike similar games, Man Bites Dog doesn’t have a winner in each round, and there is no judging or voting. Instead, scoring is by points and the winner is the first to reach 500 points. The game consists of 110 cards, one of which is the instructions for how to play. The remaining cards consist of 106 word-cards and three “Exclusive” cards. The Exclusives have a picture of a dog on them and automatically make any headline worth double the points. Each word card has a word or short phrase on it, and a point value printed right on the card ranging from zero points to fifty. The instructions say that the youngest player deals first, a pretty good indication that this is intended to be a family game. The dealer shuffles all cards and then deals five cards to everyone, including himself. Next is the discard phase, where all players have the chance to trade in up to three cards for new ones. You can decide as a house rule whether this means that you can only trade once or whether, for example, a player can trade one card three times. Once everyone has their final set of cards, everyone (again including the dealer) must try to make a headline. You can, but are not required to, use all of your cards. Headlines can be as mundane or as silly as you wish but must be logically and grammatically correct. If the majority of players agree that a headline doesn’t make sense, that player has one and only one chance to modify it or create a new one. If a player can’t make anything with what they have, they get zero points for that round. Starting with the dealer, everyone displays their headlines and the points are tallied. The player beside the dealer becomes the new dealer and play continues until someone has 500 points. If more than one player scores over 500, then the winner is the one with the highest total score. Most games finish in fewer than ten rounds. On the surface, this sounds like it should be fun: you make up silly sentences and everyone laughs at the results. But Man Bites Dog has some serious weaknesses, which can be divided into two main categories: Scoring Issues and Card Limitations. I hesitate to say that the scoring system is broken, but it does have issues. First of all, there is no reward at all for creativity. A funny and unique headline could be outscored by a more mundane entry just because they have cards worth more points. In fact, the only strategy seems to be “get the high point cards, get the exclusive card”. Over half the cards are worth ten points or less and there are only ten cards that are worth 30 points or more. To make things worse, there is no logical reason why one word is worth ten points and another is worth 50 points. Sure, “naked” (50 points) is funny, but is it really twice as funny as “psychic” (25 points)? Is “runs off with” (50 points) five times better than “loses to” (10 points)? Now, let’s talk about the Exclusive cards. This little dog is way too overpowered. Even if it means that your headline is probably one word less than everyone else’s, doubling your points is a serious advantage. During one of my games, the same person got an Exclusive three times, and it was impossible for anyone to catch her. I would rather see these cards have a specific point value, or maybe the ability to double the points of one card. The only thing stopping this card from breaking the game is the rule that you can only use one Exclusive card at a time. This game somehow manages to have both too many cards and not enough cards. Too many, meaning that shuffling over a hundred cards is awkward and not as random as it should be. In many of my games, some cards showed up over and over, while others were never seen at all. At the same time, there’s not enough of the cards that you need. Even after trading, a player can be stuck with all verbs, or none; several adjectives, but no nouns. The creators of MBD missed a huge opportunity by not making the game expandable. There have so far been three versions of the core game, the original, second edition and “new edition”. I have seen examples in reviews of words not in my deck, so I assume each edition has different cards. Unfortunately, I can’t seem to find anything other than the “new edition” game for sale where I live. The closest there is to an expansion is Man Bites Dog Deluxe. This large box version has 55 verb cards, 165 noun and adjective cards, and 10 rewritable blank cards with a dry erase pen. It also has some accessories that are, in my opinion, unnecessary. For example, there is a game board that consists entirely of spaces to put down your cards, surrounded by a “scoring track” where you can keep track of your points with the included colored pawns. But I can’t comment too much about the deluxe game because I haven’t seen it in person. The addition of themed decks such as Fantasy, Science Fiction, Sports or Natural Disasters could have changed the game completely. I for one would jump at the chance to create headlines such as “Dragon Fireballs Princess – Orc Wedding” or “Psychic Martians Invade Tomorrow”. Finally, I’d like to mention that this game has been the unfortunate victim of Political Correctness. You see, I haven’t mentioned that MBD’s cute mascot dog has a bandage on his nose. Because someone bit him — ha ha. When doing some basic research, I looked at the Amazon entry on the game. There were many one-star reviews from irate animal lovers saying they would not support any game that “encourages animal abuse”. Some even recounted personal experiences of rescuing animals “with duct tape muzzles just like in the picture”. They went on rants without even bothering to learn anything about the game itself. I have no issues with giving a product an honest review, but don’t give a bad review for the wrong reason. headline of the round, or even just 10 points for every time a headline gets a laugh. Something as simple as having seven cards in your hand instead of five could help. The Deluxe game suggests a kind of “reverse Texas Hold’em” variant, with two verb cards on the table that anyone can use in addition to the cards in your hand. Don’t give up on this game completely, just don’t expect too much from it. Debra Savage has been a geek for a very long time. She still misses the vintage board games from her childhood, when she frequently lost at Scrabble to her older brother and invented House Rules with her sister. 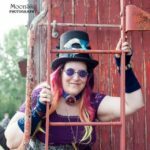 She has been a member of The USS Bonaventure, one of Edmonton’s oldest Science Fiction Societies, for decades, and can’t remember the year of her first convention. Her first love is reading and she honed her writing skills on weekly online fanfic challenges in the early 2000s. Just wait: a new adult party version of the game is coming this summer: Yeti Eats Alien! We’d like to think it will be a fun standalone game, but pair it with your Man Bites Dog deck and you could double your pleasure! Comments closed due to overwhelming amounts of spam.